the Platinum Bar offers you a unique way to discover your new favourite perfume. The start of any great bar evening involves ordering a drink in an atmospheric setting before watching the barkeeper prepare it with skill and dexterity. They might give you a drop of a selected spirit to try or explain the sophisticated bouquets. They expertly select tumblers and cocktail glasses, always pouring in just the right amount. The performance is rounded off by the decoration of the glasses. It’s a small leap from here to an institution that has been making a splash at Oberpollinger for a while now. Equally skilled barkeepers can be found behind the Platinum Bar. But instead of serving drinks, they bring fascinating fragrances to life. 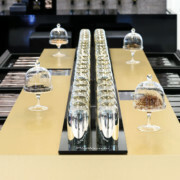 Just like the whisky bottles in a Scotch collector’s cabinet, some forty or so perfumes for him and her are arranged in silver containers on the ground-floor counter, ready to work their magic on visitors. A uniquely direct connection: no slogans or flowery titles attempt to influence customers, with the numbered perfume extracts speaking for themselves. Given this focus on the essentials, the story of how the scents were created almost fades into the background. Let us nonetheless briefly cast our minds towards Grasse, the perfume capital of the world. Almost a dozen parfumiers, who hone their fine noses in the town, have created the portfolio of the Platinum Bar, which is divided into four quality levels and which includes three bestselling compositions: N°3, which combines jasmine and currant with a sweet, woody base, its equivalent for men, N°23, which brings together black pepper and amber, and N°18, an aromatic sensation of cedar wood and coriander. Once your very own favourite fragrance has been found, the “Platinum Barkeeper” takes on the role of master filler. They will fill the perfume in a bottle or rollerball and, on request, add decorative touches, such as scattering gold flakes in the clear liquid. In the run-up to Christmas and on special occasions such as Valentine’s Day, there are even more surprises in store. And in one respect, the Platinum Bar is just like any other: whenever you visit, it’s always worth asking the experts behind the bar about the specials.